The global agricultural equipment industry is expected to grow at a CAGR of 3.5% during 2014-2019. The major drivers of the agricultural equipment industry are rising food consumption, increase in crop production, availability of credit, availability of resources, and technological development. The increasing subsidies on agricultural equipment and the increasing awareness on productivity will also boost the agricultural equipment industry. Strong economic growth in the developing nations such as China, India, and the Middle Eastern countries will further drive this industry. 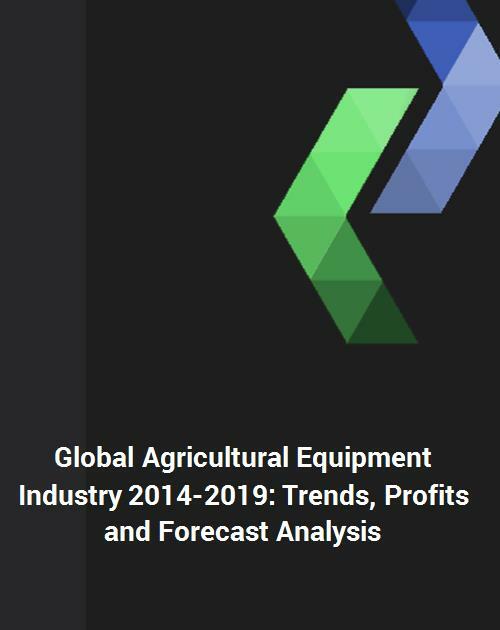 On the basis of its comprehensive research, the author forecasts that the agricultural equipment industry is expected to depict a moderate growth during 2014-2019. The tractor market will remain the largest segment in terms of both value and growth rate during the forecast period. Regular innovation in agricultural equipment with new technologies is the major driving force of the industry. Deere & Company, CNH Industrial, AGCO Corporation, and Kubota Corporation are some of the major manufacturers of the agricultural equipment industry. This unique report will provide you with valuable information, insights, and tools needed to identify new growth opportunities and operate your business successfully in this market. This report will save hundreds of hours of your own personal research time and will significantly benefit you in expanding your business in this market. In today’s stringent economy, you need every advantage that you can find. that operate in this market. - Analysis of competitive intensity of the market based on Porter’s Five Forces model which helps to understand the competitive position of industry players. - Market size in terms of value ($B) by segment, market size trend (2008-2013) and forecast (2014-2019) for key regional segments to make major investment decisions. - Regional Analysis provides agricultural equipment industry breakdown by region among North America, Europe, APAC and ROW. - Competitor analysis: growth leadership analysis, market drivers and challenges, growth opportunity analysis by segment market and by regional market that helps to ascertain a sound investment decision. - Market strategic assessment, emerging trend, innovations and new product launches, mergers and acquisitions by the market players are studied in the report. The report is in power point presentation format and has hundreds of critical data and market insights that will help in effective decision making. - Enhance your growth strategy with the information of key market segments and growth applications. - Fine tune your business expansion with analysis of trend and forecast and key emerging trends in the industry. - Know the business environment with the competitive intensity of the industry, new developments and merger and acquisition deals.